It’s not a moon but not far off the same size! I meant to post this last week following the Fantasy Flight Games reveal at GenCon, but work got in the way. So here you go, a huge and I do mean huge monster of a ship for Star Wars: Armada. Head over to the Fantasy Flight Games website and preorder this beauty now! Something huge is coming to Star Wars™: Armada. 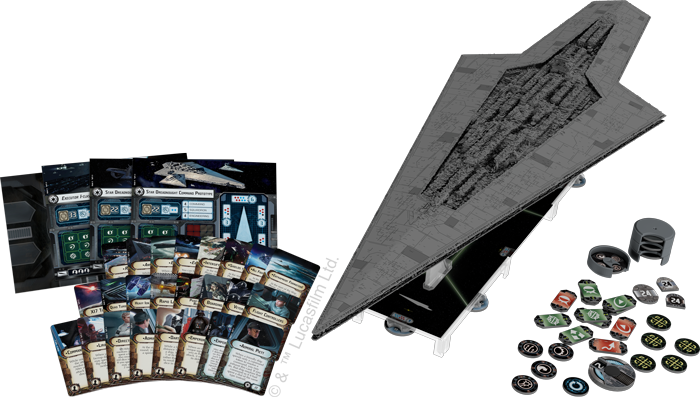 Fantasy Flight Games is proud to announce the Super Star Destroyer Expansion Pack! This expansion pack arrives to swell the forces of the Galactic Empire with the first ship of an entirely new class—huge ships. The pre-painted, beautifully sculpted Super Star Destroyer miniature within this expansion is the largest miniature yet created by Fantasy Flight Games, measuring over 24 inches from tip to tip. You can pre-order the Super Star Destroyer Expansion Pack at your local retailer or online through our webstore today! Then, read on for more information. 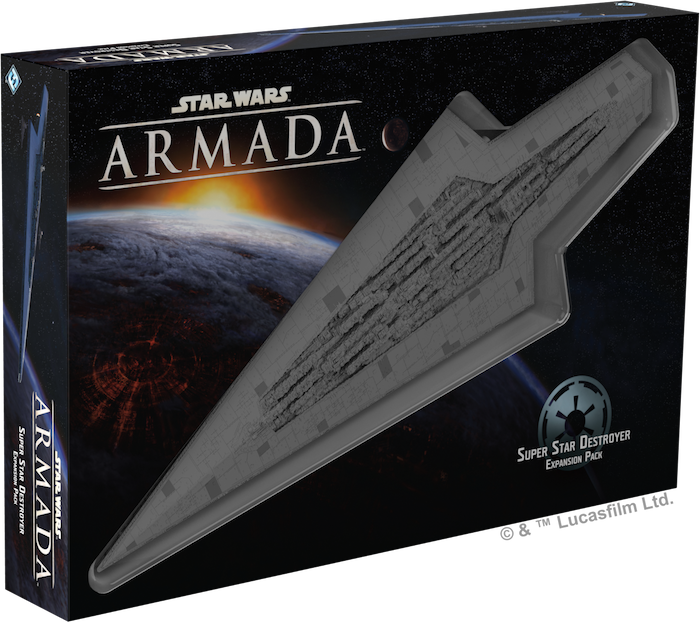 It’s immediately plain from the size of the Super Star Destroyer alone that this miniature is something special, unlike anything that has yet flown onto your table in Star Wars: Armada. In fact, the Super Star Destroyer is so large that it’s supported by one ship token placed on top of two standard large ship bases! We’ve already mentioned that the introduction of the Super Star Destroyer also marks the introduction of a new class of ships: huge ships. And this new class of ship has powers that reach far beyond mere size. For instance, the Super Star Destroyer features a total of six firing arcs—supplementing the standard front, rear, left, and right firing arcs with brand-new right-auxiliary and left-auxiliary firing arcs. And as you might expect, a huge ship like the Super Star Destroyer increases its attack powers to go with its extra firing arcs. The Super Star Destroyer can make up to three attacks from different firing arcs every round of the game. The Super Star Destroyer has six distinct firing arcs—forward, left, left-auxiliary, rear, right, and right-auxiliary. If the time for you to launch your attack has not yet arrived, huge ships also have the unique ability to pass. Once per round, when you would have to activate the Super Star Destroyer, you can choose instead to pass, allowing your opponent to activate another ship. Although the Super Star Destroyer must still activate each round, the ability to pass and delay your activation temporarily can lead your opponent directly into your trap. Even the command dials you assign to a Super Star Destroyer become more powerful. When you resolve one of these command tokens, you’ll also assign the corresponding command token to your ship! By getting more impact out of every command dial you assign to the Super Star Destroyer, you’ll be prepared to take on the entire enemy fleet on your own. All of the advantages we’ve described so far are common to every huge ship—but the Super Star Destroyer has plenty of power to offer on its own merits. The cheapest way for you to field the Super Star Destroyer is by spending 220 points for the Star Dreadnought Command Prototype. 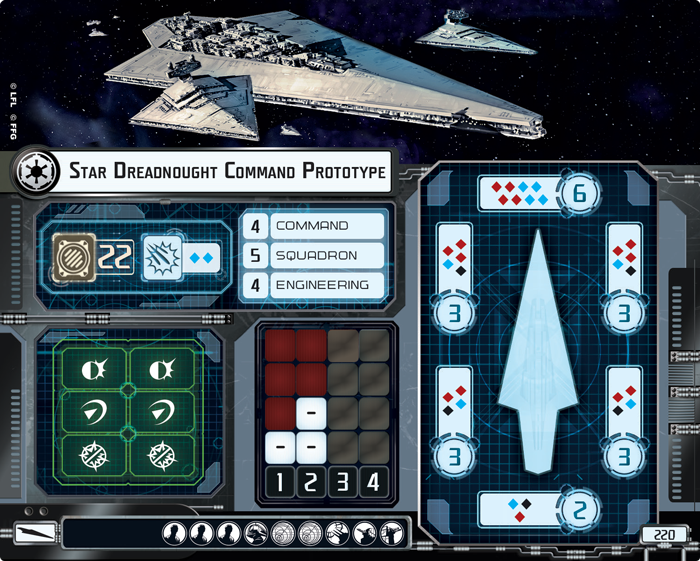 With eight attack dice from its forward firing arc, six ship tokens, a hull value of twenty-two, and nine upgrade slots, the Star Dreadnought Command Prototype offers a truly jaw-dropping addition to an Imperial fleet. And each of the other ship variants in the Super Star Destroyer Expansion Pack is even more expensive and even more powerful than the Star Dreadnought Command Prototype! Still, it’s not purely the ship that makes the Super Star Destroyer Expansion Pack so impressive. 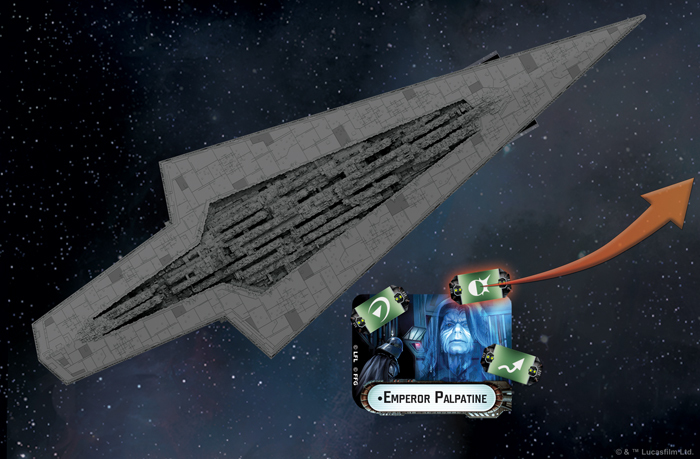 There’s also a wealth of upgrade cards that are sure to be valuable to Imperial players across the galaxy, including the debut of Emperor Palpatine himself as a commander in Star Wars: Armada. If you want to have the Emperor bless your efforts with his presence, it won’t come easily—Emperor Palpatine costs 35 points to equip as a commander for your Imperial forces. Still, his effects can be deadly as you work to pick apart and destroy your opponent’s defenses. 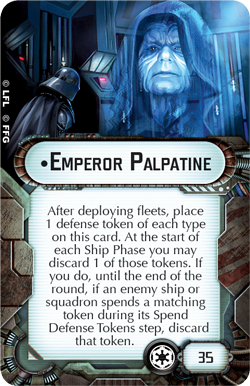 After you deploy fleets, you’ll place one defense token of each type on Emperor Palpatine. 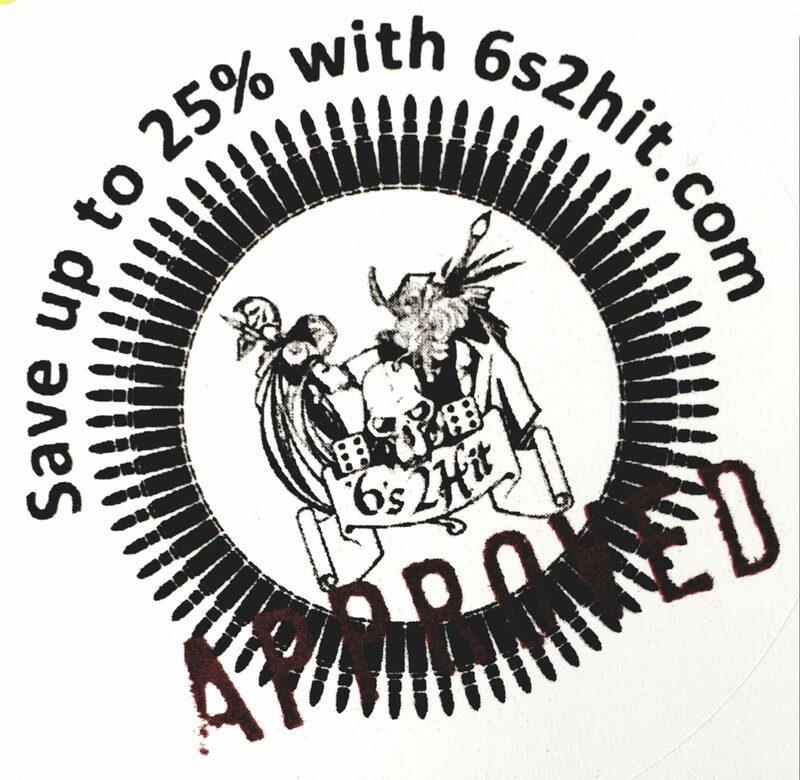 Before any ships activate in a round, you can discard one of these tokens. For the rest of the round, if any enemy ship or squadron would spend a matching token, they must discard it instead! By spending the brace token from Emperor Palpatine, you can force your opponent to discard any brace tokens he wishes to use this round! In a fashion that’s truly fitting of the Sith Lord, you can manipulate your opponent’s actions with Emperor Palpatine. If you choose wisely, you may limit your opponent’s options and leave his plans in ruins, as he must choose to lose his most important defense tokens permanently or watch his ships disintegrate under the massive attacks of your Super Star Destroyer. We’ll take a much closer look at the other ship sheets and upgrade cards included in the Super Star Destroyer Expansion Pack in a future preview! The Imperial fleet is a force to be feared across the galaxy, and with their largest and most powerful capital ship deploying to your tables in Star Wars: Armada, you can crush your rivals in your grasp. Look for the Super Star Destroyer Expansion Pack (SWM20) early in the first quarter of 2019, and pre-order your copy at your local retailer or online through our website today!